I don't post my Christmas cards on my blog until after the holiday so that any of my blog readers who get cards from me won't see it before they get one. But this one was made by my 13 year old for her dance teacher. I cut the shapes out on the cricut for her (only because she was busy doing her math lessons-normally she does it herself) and she put them together. I also made the snowy ground for her. I used some 1" wide miracle tape from Viva Las Vegas Stamps and I stuck it to white paper, tore the top (being careful to tear it toward the back side so that the entire front would have adhesive on it) and dipped it in glitter. Sammy put it all together and added snowflakes drawn with a white gel pen (I think Sakura) and spica pens. Paper on cutouts is all Bazzill. 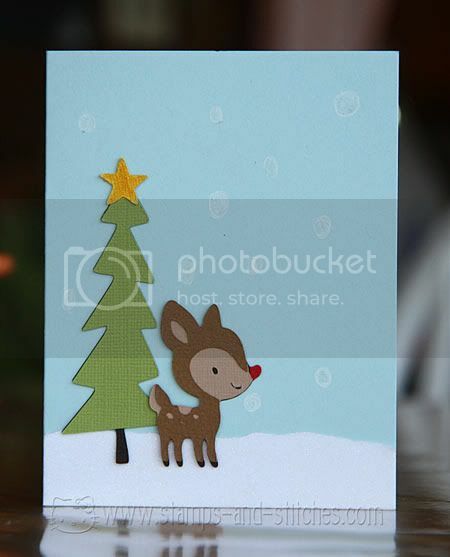 The card base is made with Stampin' Up card stock. I don't know what the white is-it's from a scrap I found lying on my desk. Cricut cartridges we used are Create a Critter for the deer and Christmas Cheer for the tree. very cute. She did a greqt job.